This is a new structure, coming soon to Aberon. The Fish Hatchery is a unique structure that replaces fishing by running hatchery pools to put their fishing poles into the chests. The Fish Hatchery consumes the fishing poles and in return will breed fish. The Fish Hatchery will breed different fish depending on the biome you build it in. If the storage chest becomes full the structure will jam and stop working until the storage chest is cleared. It is important that the Fish Hatchery's storage chest is emptied often or it will not function. How does the Fish Hatchery work? The Fish Hatchery is very simple to operate, simply select the fishing poles you wish to deposit them into input chests above Fishery Pool 1. The Fish Hatchery will then start breeding fish with them. In order to use the other pools, the Fish hatchery must be upgraded. Currently, Enchanted Fishing poles do not have any affect on the Fish Hatchery. 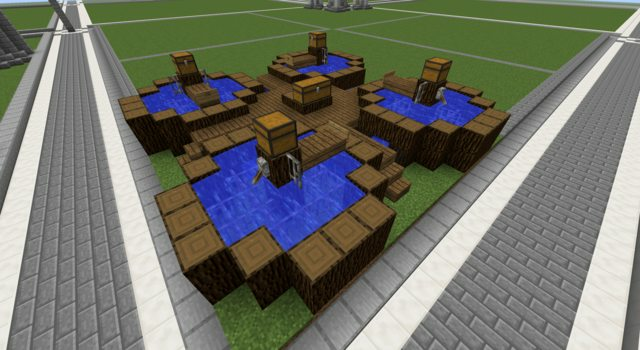 As of Civcraft 1.8, you can now purchase upgrades to the Fish Hatchery. These upgrades allow the Fish Hatcheries in your town to activate more pools.